Northwich Victoria: Woods, Charnock (Foran 44), McGuire, Teale, Wright, Willis, Blackburn, Potts (Garvey 73), Devlin (Norris 17), Mitchell, Nicholas. Subs not used: Thompson, Ralph. Chester City: McCaldon, Bolland, Guyett, Collins, Carden, Smith, Heard, McIntyre, Carey (Davies 86), Clare (Twiss 78), Stamp (Rapley 78). Subs not used: Harris, Foster. After a disappointing month of results City got back to winning ways with a comprehensive 4-0 win at bottom-of-the-table side Northwich Victoria to complete the double. What a difference from previous years when Cheshire neighbours Vics have been such a bogey side. Such was the Blues’ dominance of the game that they’ll be wondering why the scoreline wasn’t doubled – the NLP stats showed City having 22 attempts on goal, while at the other end Ian McCaldon, possibly playing for the last time in a Chester shirt, was a virtual spectator. 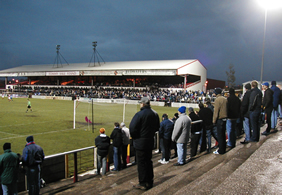 The game, played in front of about 1,500 visiting fans, started quite evenly before City began to take control midway through the first half. Steven Nicholas shot over the bar early on following a quick Shaun Teale free-kick, and soon later Darryn Stamp shot over following a fine Kevin McIntyre cross. 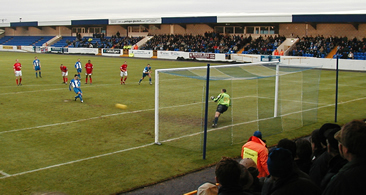 The Blues has a guilt-edged chance to open the scoring on 22 minutes from the penalty spot following a Paul Maguire handball from a McIntyre corner but, as at Leigh on New Year’s Day, Daryl Clare again missed his spot-kick – shooting to the right as Andy Woods in the home goal guessed correctly to save well. Ten minutes later City did open the scoring. 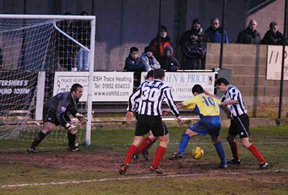 Scott Willis was adjudged to have fouled Alex Smith on the right of the box. Kevin McIntyre lined himself up before curving a superb shot around the Vics wall and into the top left-hand corner right in front of the traveling fans. Four minutes before the break Darryn Stamp doubled City’s advantage prodding the ball home from close range following another McIntyre free-kick. Vics weren’t out od it yet though and on the stroke of half-time McCaldon had to be alert to save well from a rasping shot by City old-boy Chris Blackburn to ensure City kept the two-goal half-time advantage. Recent performances have suggested that a two-goal lead may not at times be enough, but City wrapped things up with a brace of goals shortly after the interval. On 49 minutes Alex Smith’s 20-yard shot was turned in by Clare, 3-0. City began to take full control of the game and added a fourth on 52 minutes. Stamp got his name on the scoresheet again clipping the ball past Woods following a Shaun Carey pass, the goal awarded despite the assistant referee flagging for offside. The Blues created numerous chances after that and should really have increased on their lead in the last 30 minutes. 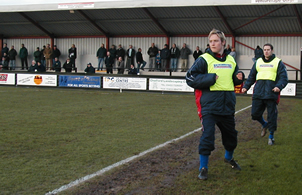 Jamie Heard and Daryl Clare missed opportunities as did substitute Kevin Rapley. Full marks to Woods in the home goal though who also pulled off a string of fine saves to keep the scoreline down to four. Forest Green Rovers: Perrin, Jones, Searle, Ingram, Richardson, Foster, Stoker, Rogers, Phillips (Sykes 90), Meechan, Cowe (McAuley 83). Subs not used: Adams, Kennedy, Giannangelo. Chester City: McCaldon, Ruffer, Collins, Bolland, Smith (Twiss 79), Heard, McIntyre, Harris, Carden, Clare, Stamp (Rapley 79). Subs not used: Davies, Foster, Regan. “Top of the league and we’re having a laugh”, sang a handful of Chester optimists in the Forest Green Rovers social club at 5.30pm on Saturday. They may have been factually correct, but the last laugh of the afternoon was with the team in black and white who had fought their way to a comfortable victory. Forest Green were totally undaunted by the lofty league position of their yellow-clad visitors and their attack, midfield and defence combined well most of the game to thwart almost everything Chester could throw at them. Everytime Daryl Clare got a sniff of the ball, there were two or three FGR defenders on his shoulder within the blink of an eye. He was also repeatedly caught out by a well-policed offside trap. Clare didn’t really get a sight on goal until injury time in the first half. But he didn’t let Chester down after a Kevin McIntyre free kick found Darryn Stamp, who hit the ball into the box for Clare to kick home at close range. It was only Chester’s third serious attempt on goal, but all Blues fans assumed the usually reliable City defence would ‘shut up shop’ during the second half and they'd secure their position as league leaders. However, Forest Green failed to read the script and put continuous pressure on the Chester defence after the interval. Within a few minutes of the re-start, an FGR attacker had the chance for an easy headed goal, but managed to head the ball over the bar instead. 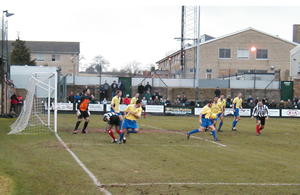 Soon after, the yellow defenders were looking even more rattled when Danny Collins had to clear the ball off the line. Forest Green also won a series of corners – each one looking more and more threatening. Ian ‘Haggis’ McCaldon may be much taller than Wayne Brown and with a much surer kicking foot, but he doesn’t seem to command the box in the same way. The rest of the defence looked distinctly edgy all afternoon, with Phil Bolland not really back to his best form. A bearded Andy Harris wore the captain’s armband, but he failed to force much inspiration from midfield. Chester’s best chance of the second half fell to Alex Smith who found himself in a one-on-one with FGR’s larger-than-life keeper, Steve Perrin. But Perrin proved again what an excellent shotstopper he is, and Smith’s strike went away for a corner. Soon after Smith’s attempt, the action diverted to the other end when the skilful Alex Meechan passed the ball across the box to totally unmarked FGR striker, Steve Cowe. He had no trouble slotting the ball home. City had barely recovered from that when, five minute later, Meechan was again threatening the goal. His shot was parried by McCaldon, but the ball fell to unmarked Scott Rogers and it was easy for him to find the net. 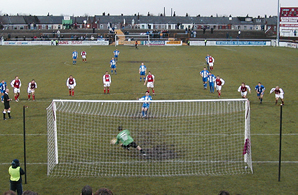 Chester made a determined attempt to get an equaliser and in the 79th minute, Mark Wright brought on Michael Twiss and Kevin Rapley to replace Stamp and Smith. Twiss did have a shot on target, but it was bravely held by Perrin as Clare rushed in for a rebound. City also won a couple of corners in the last 10 minutes, but they came to nothing. So Chester may still be top of the league, but this game was another very sharp reminder of their insecurity and no one in blue will be laughing if they fail to get any points on their next away day. Chester City: McCaldon, Smith, Regan, Ruffer, Bolland, Collins, Carey (Davies 68), Twiss, Foster, Stamp (Rapley 71), Carden. Subs not used: Heard, Harris, Buckley. Halifax Town: Parry, McAuley, Monington, Sandwith, Hockenhull, Hudson, Senior, Midgley, Killeen, Allan, Mallon. Subs: Toulson, Lee, Maslak, Sagere, Farrell. Interviewed after the game, Mark Wright pointed to the absence of Daryl Clare and Scott Guyett as a big factor in City’s defeat and to the fact that a youthful Halifax side had played rather well. Stephen Vaughan must be wondering what on earth he has to do to inspire a decent cup run in any competition. After impressing the importance of winning the FA Trophy for the benefit of finance as well as glory this week, in the media and in his programme notes, he must have been a disappointed man at five o’clock. City had done enough to earn a replay or even scrape a win but lacked finish. They were undone when substitute Farrell got behind the defence to win a corner and then ghosted in for a header which just beat McCaldon’s despairing dive at the far post. Halifax, weakend by injuries and suspensions themselves began brightly against a pedestrian City. They played them off the park for the first quarter of an hour or so. It came as no surprise when they took the lead. Kileen caught the ball from Bolland, skipped past Ruffer and was able to pick his spot for the goal. City were level, however when Smith got a second chance to cross the ball following a corner and his delicious cross was nodded in by Bolland. After this Chester gained the upper hand for a while without ever looking totally dominant. Stamp squared for Foster who couldn’t quite reach it with the goal beckoning. Then Foster scuffed a shot after a delightful chip by Smith had sent him through. There seemed to be some adjustment after City had levelled and Smith filled a more defensive role while Twiss roved forward. Smith continued to prompt and probe after the break but openings were rare. A good opportunity arose when Smith found Twiss who set off an a scintillating run to the by-line and crossed only for it to be out of reach of the incoming Stamp and Foster. A rasping shot by Davies (On for Carey) and a Collins header which ended in a startled keeper’s arms were City’s best efforts. It was Farrell who had the last word, however, and dreams of a Trophy final at Villa Park must be shelved once more. Perhaps, as a League team, City will not qualify next season. But, on this showing. there is a lot more work to be done first. Booked: Carey, Guyett, Stamp, Twiss. Chester City: McCaldon, Collins, Ruffer, Guyett, Twiss, Smith (Bolland 86), Carden, Carey (Davies 86), Regan, Clare, Stamp (Rapley 86). Subs not used: Harris, Foster. Gravesend & Northfleet: Wilkerson, Protheroe, Moore, Duka, Lee, Perkins (Walshe 55), McKimm, Owen, Drury, Haworth (Abbey 45), Oli. Subs not used: O’Reilly, Evans. McClements. 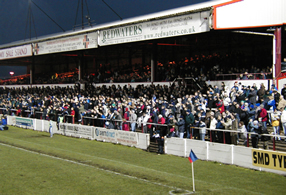 Lack of discipline and some hesitant defending cost Chester two points on the title trail. Gravesend and Northfleet came back to haunt City after ending their FA Cup run a few weeks earlier. A tough and resilient side, Gravesend fought back well after seeming to be dead and buried. Two nil down at the break and in danger of being overwhelmed, the visitors got back into the game by scrapping better in midfield and taking advantage of a nit-picking referee who began to increasingly annoy the home support. City players gave away free kicks in dangerous areas on either flank and, worse, found themselves being cautioned. Guyett was hauled back and booked by the referee for not releasing the ball quickly enough. From the resulting kick Moore capitalised on a hesitating defence to side-foot a goal back from the six-yard box. Three minutes later he equalised with an almost mirror image set-piece move. Chester still might have snatched victory from the jaws of a draw when Twiss engineered an opening for Stamp. The tall striker was unlucky to see his effort rebound back off the post. The dropped points were all the more galling after the way City played in the first half. They out fought tough opponents to forge into the lead. From Guyett’s throw on the right, Smith tapped a delightful return pass. Guyett centred for Stamp to head back and Clare to score with a deft header just inside the post. Clare added a second shortly afterwards from the penalty spot. Protheroe had handled Regan’s cross in the area. City had further chances to score a killer third – most notably when Clare was put through at the beginning of the second half he chose to square the ball instead of shooting when we would have all put our house on him shooting to complete what would have been a third hat-trick in four matches. An intensely frustrating ending then, after a rousing first half display. Let’s hope City can build on their positive play from Saturday and exorcise the complacency or lack of concentration or whatever it is that caused them to go off the boil. Leigh RMI: Martin, Harrison, Lancaster, Redmond (Whitehead 76), Shepherd, Roscoe, Maden (Peyton 36), Rezai (Harris 65), Rickers, McNiven, Daniel. Subs not used: Barrowclough, Tickle. Chester City: McCaldon, Ruffer, Guyett (Bolland 64), Collins, McIntyre (Twiss 71), Carey, Smith, Carden, Regan, Stamp, Clare. Subs not used: Harris, Davies, Rapley. City continued at Hilton Park where they’d left off at the Deva last week with a comprehensive victory over a Leigh RMI side struggling at the wrong end of the table. Manager Mark Wright was able to name an unchanged side from that which convincingly beat The Railwaymen 5-0 on Boxing Day, striker Daryl Clare shaking off an ankle knock received in that encounter. City were back by over 1,500 traveling fans who created a party atmosphere for what must have seemed like a home game for the players. Persistent rain overnight had left the pitch heavy in places though there was no problem with the game taking place. 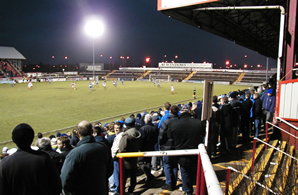 In a fairly even though uneventful start, with some players losing their footing, it was City who carved out the better of the openings but had to wait until the half-hour for their first chance on goal and that came after referee Tatton had awarded the Blues a penalty kick after ex-City player Martyn Lancaster was adjudged to have handled an Alex Smith cross in the area. Daryl Clare stepped up but placed a poor spot-kick to the left of Ian Martin, making a home debut for Leigh, who saved with ease. However it only took Clare a couple of minutes to make amends and open the scoring. McIntyre took a quick short corner to Smith who swung in a dangerous cross into the six yard box where Clare turned and smashed the loose ball home from three yards. Two minutes before the break Darryn Stamp doubled City’s lead as he reacted quicker to flick in a near-post McIntyre cross with Steve Redmond in close attention. A couple of minutes after the break and Stamp added the third. McIntyre’s right-wing corner was swung in with the wind, an attempted clearance only saw the ball lofted high in the penalty area and Stamp was quickest to react to head home. City missed several chances to extend the lead, the best falling to Smith ten yards out who seemed to take an eternity to work the ball onto his left foot after jinking past Martin before seeing his snap-shop crash off the crossbar. Midway through the half Manager Mark Wright made a couple of substitutions with Scott Guyett being replaced by Phil Bolland and Michael Twiss returning to his old stamping ground at the expense of Kevin McIntyre. A minute after Twiss’ arrival Leigh pulled a goal back though Daniel after fine approach play down City’s left. The City crowd fell quiet, and five minutes later the battling Railwaymen had reduced City’s lead to one as Peyton scored with a shot through a crowd of players. City endured a couple of anxious moments before Clare added a fourth to calm any supporters fears of a comeback of Northwich proportions from 12 months ago. Regan was set free down the right and his pin-point cross was headed back across goal by Clare to wrong foot Martin. The keeper then made a couple of good saves from Stamp and Clare and a free header went begging at the far post before Clare duly completed his hat-trick shooting past Martin in a one-on-one after being set-up by Paul Carden. In stoppage time Smith capped yet another fine performance with a jem of a goal as he curled a free-kick up and over the Leigh wall to find the top right hand corner.